Last issue was the first one we have seen where the fab creative team that has so far guided this book along was no more. Ok, maybe that’s overstating it a tad, as both Andrew Cartmel, as writer, and Lee Sullivan, as artist, are still happily churning out wonderful stuff. The missing cog though is an important one, creator Ben Aaronovitch himself. I’m not sure if this is a permanent change, or just a one arc deal, but I’m sure he’s keeping a keen eye on everything. From reading the last issue alone you probably wouldn’t have even noticed the change, as continuity of character and tone was all there. Which is nice. Last issue saw the focus fall on two areas not really explored so far in Peter Grant’s comic adventures so far. Firstly, the Thames. 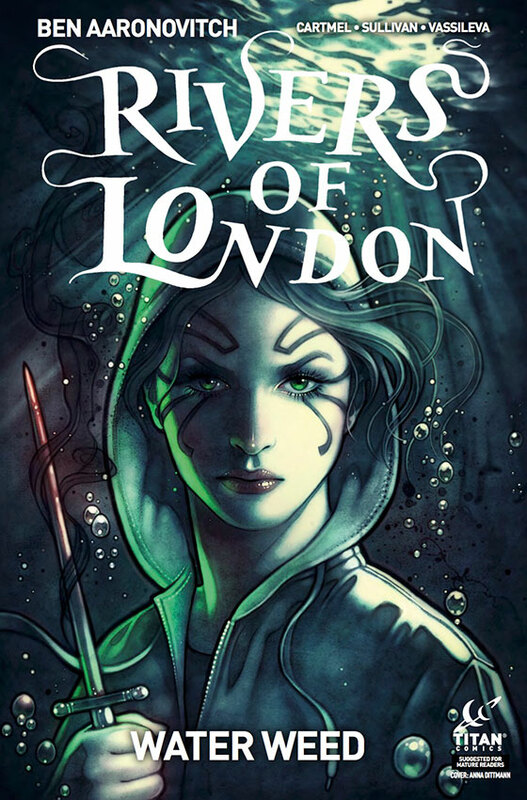 Obviously for a book called Rivers of London, a focus on the Thames was inevitable, equally as much for its importance to both London in the real world and the London of Peter’s world, peopled as it is by river goddesses and the like. Peter’s girlfriend, Beverley, of course is a river goddess. The second area previously unexplored, though playfully mentioned here and there, is drugs. In this case, specifically a magical variety of very potent weed, that has certain side effects for the, to steal a phrase, non-muggles of the world. Time to find the dealer, a mysterious woman with distinctive facial tattoos. That same women of course sent some goons at the end of last issue to scare Chelsea and Olympia, Beverley’s fellow river goddesses, though rather younger and more impetuous than her, after they had liberated some weed from her dealers. The goons didn’t do so well, which is why this issue begins with Peter and Nightingale interviewing them. Peter uses their evidence, and that of Olympia and Chelsea , to put his considerable detecting chops to work, and traces back through the stolen car, to the type of boat that delivered the weed, where the boat was made, and finally to the two young students who were the delivery guys we met at the beginning of issue 1. They were happy to chat, though they couldn’t help much as they were kept in the dark about everything. A very nice issue indeed. Lots of story building, great dialogue, and plenty of detective work replacing the overt magic theme of last issue. Cartmel juggles the various balls with ease, as does Peter and Nightingale. Lee Sullivan provides his normal solid, clean art and uncomplicated layouts, perfectly pacing out the story. Two issues in there’s been plenty to read and enjoy, yet we still are as much in the dark as when the story began. That air of mystery is why we will be keenly waiting the next issue, to find a few more pieces to slot together. Top notch work. A series that always entertains, and never disappoints.